Published: Dec. 28, 2015 at 03:50 p.m. Updated: Sept. 1, 2016 at 12:04 a.m. Here we are entering Week 17 and I can't believe two things. One, that the football season is already almost over, and two, that so many of you are still playing fantasy in Week 17! What are you doing? Unless it's just for fun and to rack up total points, there's really no reason to play in Week 17. There's too much risk that fantasy squads will be unfittingly limited if starters are rested, and while that doesn't seem to be a widespread problem this year, we know it’s likely to be that way again soon. Anyway, rant over. Seeing as there's one week left to go (and we owed KFC one more article as part of this sponsorship), here are 15 names to target on waivers for Week 17. Feel free to hit me up on Twitter for more specific questions. 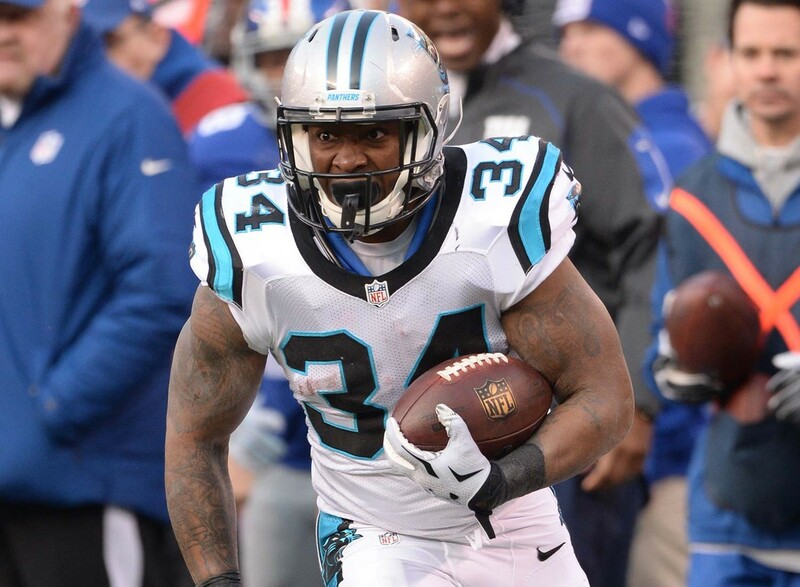 After seeming to take the lead in the Carolina backfield in Week 15, Artis-Payne fell flat for fantasy owners in Week 16 with just 56 total yards on six touches. However, those who scooped him up (and are still playing in Week 17) can roll him out once again, as Fozzy Whittaker suffered a mild high-ankle sprain against the Falcons and will be out for Week 17. That should free up some more touches for CAP, who will be a low-end RB2 option for the Panthers (who are still playing for home-field advantage) against the Buccaneers this Sunday. White still isn't seeing a ton of touches in the Patriots offense (averaging eight per game over the last month), but he's making the most of said opportunities (1.59 fantasy points per touch over the last month). At this point, owners in need of a running back cannot avoid White's efficiency, especially in PPR formats. The specter of #Belitricks always looms over this backfield, but White has enough upside to merit starting consideration as a low-end RB3/flex. Powell outplayed Chris Ivory for roughly the fifth week in a row on Sunday, and figures to be heavily involved in the Jets' game plan against Buffalo this Sunday. Ivory suffered another knee injury against the Patriots, and with the Jets now pushing for a playoff spot, the team could limit his touches to keep him fresher for the postseason. That would lead to more work for Powell (and probably Stevan Ridley). If you picked up Powell earlier in the season, feel confident trotting him out again in Week 17. And if he's somehow still hanging around in your league, he's worth and add going against a Buffalo defense allowing 17.55 fantasy points per game to the position over the last month. If either of these Bills backs are available in your league, they're among the best options to target for Week 17. They each found the end zone last week, and split touches fairly evenly (19-11 in favor of Williams). Greg Roman's system in Buffalo works through the ground attack, so even in a tough matchup against the Jets top-notch run defense, Williams and Gillislee will get a fair amount of looks. They'll both be low-end flex options for Week 17. Running back is a vast wasteland right now, but those in need of a volume based play could pluck Brown from the waiver wire. He leads the team with 26 rushes over the last two weeks, and got a goal-line looks against Oakland on Christmas Eve. He's a low-upside play, however, as Danny Woodhead will also get plenty of work. Plus, he's facing the staunch Denver defense. But for those actually playing in Week 17 combing the waiver wire for running back help, well, beggars can't be choosers. While the Pittsburgh passing attack let countless fantasy owners down in Week 16, those still playing in Week 17 should look to return to the well once more. The Steelers are fighting for their playoff lives, and will likely lean on the passing attack to get past the Cleveland Browns, a team with a patchwork secondary. That puts Wheaton on the fantasy radar once again, as his 41-yard outing last week represented his lowest total of the last five weeks (the same cannot be said for Martavis Bryant). Wheaton will be a boom-or-bust option in Week 17. Since Week 14, Aiken has hauled in 78 percent of his team-high 27 targets for 284 yards and a touchdown. While his scoring upside is limited in an offense now being led by Ryan Mallett, Aiken at least offers a safe weekly floor -- especially in PPR formats. The Ravens will travel to Cincinnati in Week 17, but the Bengals could have a first-round bye locked up after Monday's game against Denver. Aiken will be a solid WR3, with upside if the Bengals use Week 17 to let their already banged up secondary heal before the playoffs. Since returning in Week 14 from injury, Snead has posted 273 receiving yards on 21 receptions, and has even seen one more target than Brandin Cooks in that span. Snead's scoring drought (no touchdowns since Week 8) is bound to end soon, and with only one more game left in the year perhaps Drew Brees will try to help his young pass-catcher out. Snead has a great floor in standard leagues (75-plus yards in each of his last three games), with great upside if he does return to the painted area. He's at worst a high-floor WR3 for Week 17 against the Atlanta Falcons. Washington becomes a fantasy asset when Cecil Shorts is out of the lineup for the Texans, as he's caught all four of his touchdowns on the season with the former Jaguar on the sideline. If that's the case again in Week 17 (which it might be, if the team plays it safe with Shorts' hamstring in advance of the playoffs), Washington will be a decent punt play as a WR3 facing one of the NFL's most porous secondaries in the Jacksonville Jaguars. Inman, a former CFL star, has led the Chargers wide receivers in each of the last two weeks, with yardage totals of 78 and 82. He added a touchdown in Week 16 for good measure, too. Inman is an explosive athlete who is able to turn the short passes of the Chargers offense into longer gains, and with so many other pass-catchers battling injuries in San Diego, Inman becomes a legitimate fantasy option. He does face a tough task in Week 17 against the Denver secondary, though, so only consider picking him up and starting him if you're out of other options. Somewhat surprisingly, Ertz leads the Eagles in targets over the last month with 41, just shy of 26 percent of the total passing game pie. During that span, he's finished each week as a top-12 option among tight ends. This week Ertz faces a Giants defense that simply cannot cover tight ends, especially athletic playmakers like Ertz. Throwing out their games against the Dolphins and Jets, the Giants are allowing 11.87 fantasy points per game to the position over the last five weeks. With Ertz' role increasing as he heads into a dynamite matchup, he'll be a top tight end option for the season's final frame, and he's available in over 80 percent of NFL.com leagues. McDonald struggled with drops in Week 15 (his first game back from a concussion), but righted the ship in Week 16 by reeling in five of his seven targets for 61 yards and a touchdown. Blaine Gabbert has loved targeting McDonald when they're on the field together (15 percent of Gabbert's total attempts), which puts McDonald back on the streaming radar in Week 17 when he faces the Rams. Largely unnoticed by the casual fan, Bradford has actually been playing some pretty good football for the Eagles over the last month or so. His performance has just been overshadowed by off the field drama in Philadelphia and elsewhere. Regardless, Bradford gets a juicy (but meaningless) matchup against the Giants secondary in Week 17. While the Saints defense is setting records for passing touchdowns allowed, the Giants lead the league in passing yards allowed with 4,600, and are threatening to set a new NFL record for most passing yards allowed in a season (current record is 4,796, held by the 2011 Green Bay Packers). Bradford has thrown for 360-plus yards in each of his last two games, making him an ideal streaming (or DFS) candidate for Week 17. Wow, I never thought I'd see the day where I'd write up Brandon Weeden as a legitimate waiver wire option, but welcome to the 2015 season! It's been weird all year, so why not end on the most bizarre of notes by starting Weeden? Need convincing? For starters he's facing a Jacksonville defense allowing the fourth-most fantasy points per game to quarterbacks and the fourth-most passing yards per game. He'll also be playing at home in a potential win-and-in scenario for the playoffs (pending the result of Monday night's contest). Weeden has also played well in Bill O'Brien's system, completing 61.5 percent of his passes with three touchdowns and just one interception the last two weeks (with a rushing score thrown in for good measure). Look, it's Week 17, you shouldn't be playing fantasy anyway. But if you are and you're in need of a deep quarterback streaming option, Weeden is worth a look.